Having well-planned weight loss goals can really help your thoughts and wishes turn into action with a happy conclusion. Goal setting can make the difference between success and failure with weight loss. Goals are there to help keep you motivated, determined, and focused. They are there to help lay the foundation and give direction for your new healthy way of life. Here are eight tips to help create successful weight loss goals and get your started. 1. Personalize your goals. Set realistic, attainable goals that are within your capabilities. Make sure you take into account your limitations and potential obstacles you may encounter. Tailoring your expectations to your personal situation helps you set achievable goals! 2. Keep your goals realistic. Remember, healthy weight loss occurs slowly and steadily. You didn’t gain the weight over night so don’t expect to lose it that quickly either. For healthy weight loss, aim to lose one to two pounds a week; meaning you’ll need to burn 500 to 1,000 calories more than you consume each day. 3. Write it down. 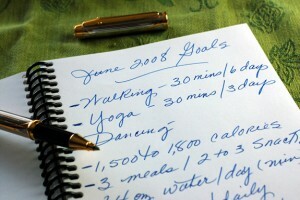 Keeping a food and exercise journal is a great tool for successful weight loss and maintenance. 4. Set short- and long-term goals. Short-term goals keep you engaged, while long-term goals motivate you over the long haul. Your short-term goals are the stepping stones to reaching your long-term goals. Start small and build toward your long term goal. It’s more helpful to plan a series of small goals that build on each other instead of one big, complete overhaul goal. 5. It’s a process, stay focused. Make your goals produce goals, i.e. aim to exercise regularly, rather than outcome goals, such as losing 50 pounds. Behavior modification (changing the behaviors that have caused you to put on the weight/your habits) is the key to weight loss. Make sure that your process goals are realistic, specific and measurable! 6. Bounce back from setbacks. Setbacks are a natural part of behavior change. Don’t get discouraged just try to bounce back stronger and more determined. 7. Evaluate your progress and adjust your goals if needed. Review your goals each week. Did you successfully meet your goals last week? Think about what worked and what didn’t. Be willing to change your goals as you progress in your weight-loss plan.